Image: Flag of Washington, D.C. 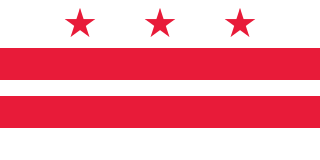 Description: The flag of the District of Columbia. Title: Flag of Washington, D.C.
Credit: own code according to Construction Details (Government of the District of Columbia, untitled monograph, 1963, pp. 21-23. This page was last modified on 21 July 2018, at 15:00.